Regulators | Metro Services Inc.
Metro Services, Inc. (MSI) has a full line of regulators for most applications and many types of gases and/or liquids. Pressure reducing, ratio, pressure relieving, pressure monitor, and many other types are offered. As with all of our products, the regulators come with the full support of MSI’s engineering department. 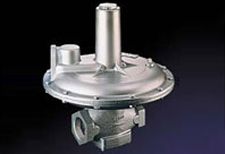 The DUNGS FRI pressure regulator combines a pressure regulator and a 50 micron gas filter in one housing. Various combinations are possible using the FRI with the DMV modular system. With mounting kit, FRI pressure regulator with gas filter directly mounts upstream of the DMV (Dual Multi Valve); no piping required. When FRI regulator is mounted downstream of the DMV (dual multi valve), the gas filter is mounted to DMV inlet. Regulator output pressure monitored by direct mounting an A2 type pressure switch to FRI. Additional ports to sense inlet and outlet pressure are also located on the threaded flanges. Lock-up Regulator (The outlet pressure shall not rise more than 15% or 3 in. W.C, whichever is greater, above the setpoint). The DUNGS FRG is recommended for industrial and commercial heating applications. It is suitable for natural gas, propane, butane, air and other inert gases. The DUNGS FRG proportionator/zero governor has an adjustable setpoint spring and nonadjustable counterspring. Beyond its standard configuration, the 121 regulator has variations that can serve the following functions: zero governor or atmospheric regulator, differential regulator, back pressure regulator or relief valve, vacuum regulator, and vacuum breaker. The 121 is an external control regulator that can be used in commercial, industrial combustion, and distribution applications. 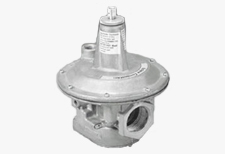 The 122 regulator is designed specifically for industrial combustion applications. Carefully engineered internal sensing produces accurate pressure control without an external control line. Just in case the specific application necessitates one, a tap is provided on the 122 regulator to make the connection of an external control line a simple matter. Variations are available to allow the 122 to serve the following functions: zero governor or atmospheric regulator, differential regulator, and back pressure regulator or relief valve. 043 Regulators are available in angled or straight-through bodies, affording variable mounting positions. The model 143-80 is designed for domestic service and small industrial and commercial applications. Its union nut style connection makes it especially easy to adjust. 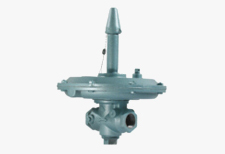 It is available in standard or internal relief valve configuration. The model 243 Service Regulator is a large capacity industrial service regulator designed for commercial, industrial, and gas distribution use. As a result of the union connection between the fully interchangeable bodies and the diaphragm case, they have remarkable field versatility. They are easy to install, adjust, inspect, and service in all piping arrangements. The mode 243 can be used in a variety of applications such as: factories, foundries, district regulator stations, commercial laundries, hotels, etc. 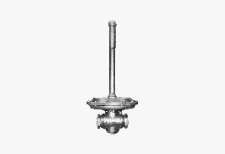 They are designed for use on all types of gas fueled equipment including boilers, burners, furnaces, ovens, heaters, kilns, engines, air conditioners, etc. The 046 family of high pressure regulators is easy to install, adjust, inspect, and service in all piping arrangements. Typical applications include farm taps, field regulator applications, and high pressure industrial air or gases. Six springs available to provide outlet pressure ranges from 3 psig to 200 psig. 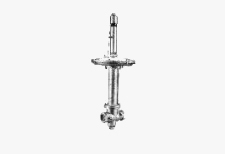 Five springs available for internal relief valve models providing outlet pressure ranges from 3 psig to 125 psig and six springs for pressure loaded models providing outlet pressure ranges from 5 psig to 100 psig. The 2″ 141-A regulator is designed for high pressure applications such as intermediate and small volume loads on gas transmission lines. It is excellent for single and double stage reduction ahead of the service regulator. The 141-A can be used on pipeline taps serving remote farm, domestic, commercial, and industrial customers. It can also be used on other kinds of high pressure loads including producer field work, high pressure burners and compressed air systems. 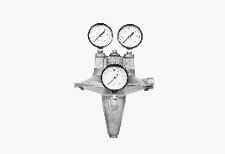 The Invensys Energy Metering model 1100 pilot-operated regulator is the most versatile of all 2″ pilot-operated regulators available to the gas industry. With an option of six quickly interchangeable springs for the pilot, the Model 1100 covers its complete controlled pressure range with no sacrifice in accuracy or performance. The model 1100 can be used for any installation requiring accurate control where the inlet pressure does not exceed 400 psi, with an outlet pressure range from 3″ w.c. to 100 psi, and flows up to 400,000 cubic feet per hour. The Invensys Energy Metering model 1200 pilot-operated regulator is a 2″ intermediate capacity regulator for high pressure applications. It is the high outlet pressure version of the widely used Invensys Energy Metering model 1100. An integral built-on downstream control line is standard for the 1200 making it a completely self-contained regulator for maximum ease of installation. The model 1200 can be used for any installation requiring intermediate capacity and high outlet pressure applications including high pressure regulator sets, town border stations, city gate stations, high pressure distribution and transmission systems, and high pressure industrial sites. Outlet pressures range from 20 to 600 psi and the unit can handle flows up to 789,000 cubic feet per hour. The ES-Series ratio regulators are used in applications where gas to air proportional flow is required. The gas flow is controlled as a function of the air pressure through a loading line which connects into the top of the regulator. As the system air pressure increases, it forces the ratio regulator valve to open causing the outlet pressure to increase until the two pressures balance. As the load line pressure increases, the ratio of the outlet pressure to the load line pressure will be slightly less than 1:1. The ratio regulators have a bias adjustment for varying the gas flow when setting the burner at low fire. 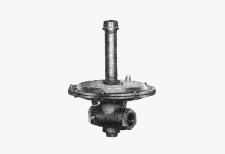 It can be used to increase or decrease the gas flow resulting in gas rich or lean combustion. The adjustment is restricted in the gas rich direction therefore limiting the gas flow at zero air pressure. 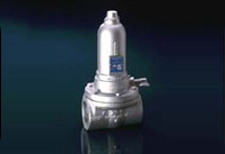 Ratio Regulators are control valves only and cannot be used as gas shut-off valves. The ratio regulators are designed to optimize performance as ambient temperature and inlet pressure vary. UL recognized and CE approved for natural gas, propane, and butane. Valve seat design for consistent low fire repeatability. Balanced double diaphragm design allows regulator to operate over a wide range of inlet pressures while minimally affecting outlet pressure. Synthetic rubber diaphragms for excellent low temperature performance. Inlet pressure taps with connector (1-1/2î, 2î & 3î NPT (Rp) models only). These regulators are designed primarily for main burner and pilot load applications where precise control of tiny flows is an essential operation requirement. Housings are cast aluminum. Outlet pressures may be varied by changing the diaphragm spring. 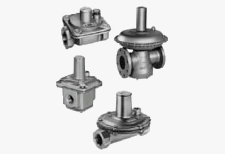 Housings are aluminum for sizes through 3î, and iron for the 4î size. The RS Series is designed primarily for main burner and pilot load applications. They are ideally suited for industrial heaters and boilers. 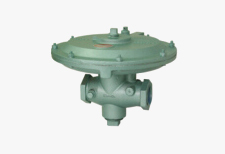 The double diaphragm balanced valve design prevents the inlet pressure from acting on the valve. Housings are aluminum. The 325-5A is a lever acting regulator with aluminum housing. It features a high leverage valve linkage to deliver positive dead end lock-up and precise regulation control from full flow down to tiny pilot flows. The 325-5A can be ordered with various springs to accommodate outlet pressures from 4îw.c. up tp 2 psi. 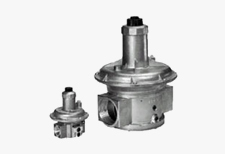 AR Air Regulators in multiple burner systems, hold constant air-fuel ratio and the mixture pressure with reducing burner port area of up to 90%. These high temperature zero regulators will provide the same service as the standard BZR for higher ambient or gas temperatures. 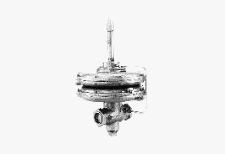 The BZR is a precise gas flow control regulator for all combustion systems. Used with Proportional Mixers, Nozzle Mix Burners, positive or negative furnace pressures etc. A patented compensator automatically adjusts the valve position to hold constant outlet pressures at all flow rates. The zero regulators will hold the outlet pressure within +/- 2 mm WC over the full range of the turndown. The BZR-B is designed with a compensation spring adjustment to bias valve to provide smooth transition to excess of air at low fire. The fuel/air ratio can be held at stoichiometric conditions at high fire. When turned down to low fire the fuel ratio is automatically reduced, creating lean burner conditions. The FCR/PCR regulators offer maximum control and fuel efficiency on applications involving preheated air to the burners, or where burners are firing against varying back pressures. 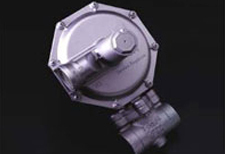 Simple air metering orifices coupled to the unique balancing regulator provide accurate control of the air-fuel (gas or oil). The regulator holds a constant air-fuel ratio from cold start-up through hot air operation. The OAR Oil/Air Ratio Regulator is used on straight oil or dual fuel systems. It is impulsed from the combustion air source. High turndown can be attained, 10:1 or higher. 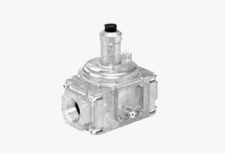 The regulator is designed to produce oil pressure 30 times the impulse pressure. The SO/SB Shutoff Regulator is used in the gas line to automatically shut off the fuel when the combustion air or any remote signal pressure drops below a predetermined limit. Shutoff control is by means of an adjustable spring. The SR Reducing Regulators feature a large main diaphragm and adjustable compression springs. 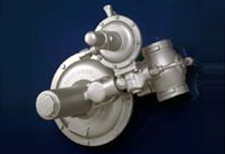 The main diaphragm adjusts the valve to maintain a constant pressure. The SR may also be used in air line to maintain constant burner pressure differential on systems where burner chamber pressure varies. They are available in 4 different temperature versions.